With most LED TV’s, no backlight is usually caused by failed LED modules. Because they are wired in series like Christmas lights, it only takes one failed LED to take down the entire backlight. I got this TV and the owner indicated there was sound but no picture and he could see moving images using the flashlight test. When I probed voltages on the boards, all voltages were present and the backlight on and power supply on signals were being sent from the main board. Voltage was also sent to the backlight strips. 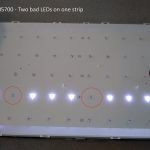 I didn’t have a LED tester so I gambled and ordered a full set of three replacement strips from an ebay seller in China. Part numbers are 69161L-1974A and 69161L-1975A . They were sent tracked epacket and arrived in just under 2 weeks. Taking apart the TV, I broke off one of the standoffs holding up the panel and had to epoxy it back. Though the pieces slide in, it probably is safer pushing the clips or body than the standoff. The old strips are double-side taped to the chassis. I pried them off with a scraper but popped off almost every lens. I also couldn’t figure out how the connector inserted so broke each one to remove it. Good thing I was replacing all of them. When reconnecting the strips, I realized the connectors were pushed down from the TOP and not inserted from the side which I was expecting. Before assembling the entire TV, I tested the backlight with everything connected except the LCD panel and the backlights came on. I could then finish reassembling the TV. Make sure you set your backlight levels lower to increase the life span of the LEDs. Update: I ordered a LED tester and found two of the three strips had burnt out LEDs.